If the word “mindfulness” makes you roll your eyes and think of happy people frolicking (in slow motion) through a meadow like they’re in some sort of pharmaceutical commercial, me too. Or maybe a zen person on a beach in a meditation pose. But here’s the problem: I am a therapist who teaches “mindfulness” techniques to help people with stress, yet I hate calling it that. Why? It’s a catchall phrase that is so overused it seems to have lost its meaning. So, what, actually is it and what do I prefer to call it? Mindfulness is just simply paying attention. To the present moment. Not the past, not the future. Without judging it, fixing it, or trying to change it. The term mindless seems a more apropos term to describe many of our lives, as we have become a screen-fixated culture of people who pay less and less attention to the IRL moments and more to our social media feed. We miss out on conversations, on priceless facial expressions, the sound of the wind on a cold winter day, the feel of our child's embrace, etc. I know, I'm getting commercial-like on you, but those things do happen IRL. Not just commercials, I promise. When we learn how to tune in, we enjoy our lives more, we feel less depressed, we're better able to communicate with those we care about, we feel more connected and less lonely, we sleep better, and the list goes on. I feel that there are myths that we buy into about mindfulness because of the eye-roll worthy connotations that go along with it. The first myth is that we're too busy for all that nonsense. That's great for people with the luxury of spare time, but not for me. I have too much to do. Another myth is that you have to be an experienced yogi to be mindful. It's a myth that you have to meditate to "do mindfulness." It's a myth that you're automatically bad at it because you're mind wanders and races the minute you try to slow your thoughts down. 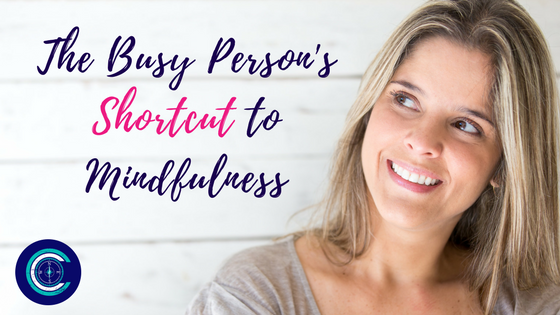 You can actually be mindful in the smallest of moments and feel great about tuning in and checking in with yourself. Try this: When you wake up in the morning, take 2 minutes to stretch while focusing on each body part you're stretching. When you are driving, turn off the radio or podcast and pay attention to your thoughts and feelings. At a red light, take that as a cue to stop, breathe, and check in with yourself. When you are finished in the bathroom, pause before leaving and take deep breaths, check in with your body, thoughts and feelings. What does it mean to check in? Scan your body for discomfort or tension and bring your attention there. Take deep breaths that make your stomach expand and attend to your thoughts. Be with yourself for that time rather than lost in your thoughts and in your mental to-do list. Come back to earth, back to yourself, and slow down for a moment. It will make you more productive, focused and efficient in the long run. I really want to help you go from mindless to being able to pay attention when you feel stressed and overwhelmed. To stop hot-potatoing out of stress with more mindlessness. Because I've found myself teaching the same exercises so much recently, I decided to put them on paper in once place. You can grab more shortcuts to mindfulness below.